A fun Veggie Buddha Bowl recipe that’s packed with wholesome ingredients, is simple to make, and customizable to your families preferences! Thanks to Produce for Kids for sponsoring this post! As always, all opinions are my own. In the nearly 3 years I have been blogging, developing recipes, and photographing food, I don’t think I’ve had as much fun with a project as I did with this Rainbow Veggie Buddha bowl for kids. This bright, fun, and nutrition-packed dinner is super easy to prepare, and even more fun to put together! Veggie Buddha Bowls are a great way to get more veggies into your family, easily. My goal was to come up with a kid-friendly buddha bowl recipe. I sat thinking about what would encourage my 9-year-old to dive into a bowl packed with veggies and grains. Vibrant colors popped into my head. I knew if it looked bright and delicious along with a touch of fun, she would be on board. I got to thinking about what veggies I could try and then I decided I was going for it – I was going to add ALL the VEGGIES – and the rainbow theme was born. Who could say no to this vibrant dinner option? I went with a combo of roasted veggies and fresh veggies. Choose what you think will go over best with your family. There are so many options in each color category once you start thinking about it. 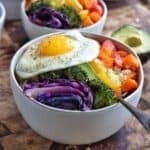 How To Make A Rainbow Veggie Buddha Bowl? Because I think options are key for kids, I gave my family the choice of quinoa and farro. Start with layering grains as the base, then add on veggies into a rainbow shape. Get creative and showcase as many veggies as you can fit! I wanted to add a bit more protein and thought a fried egg was the perfect addition! To quickly get this meal together, start by cooking the grains. Grains can take from 30 – 45 minutes to cook. Meanwhile, chop and roast the veggies you’d like cooked. I roasted sweet potatoes, purple cabbage, and broccoli. For other veggie options, I used red and yellow tomatoes, carrots, peppers, and avocado. Leave the fried eggs for last to keep them nice and hot! There are a lot of options for dressings for these veggie buddha bowls. My favorite is the yogurt based ranch dressing from Bolthouse farms, but salsa or another salad dressing would work great as well! I am happy to report that using the cold leftovers the next day made for a delicious lunch. 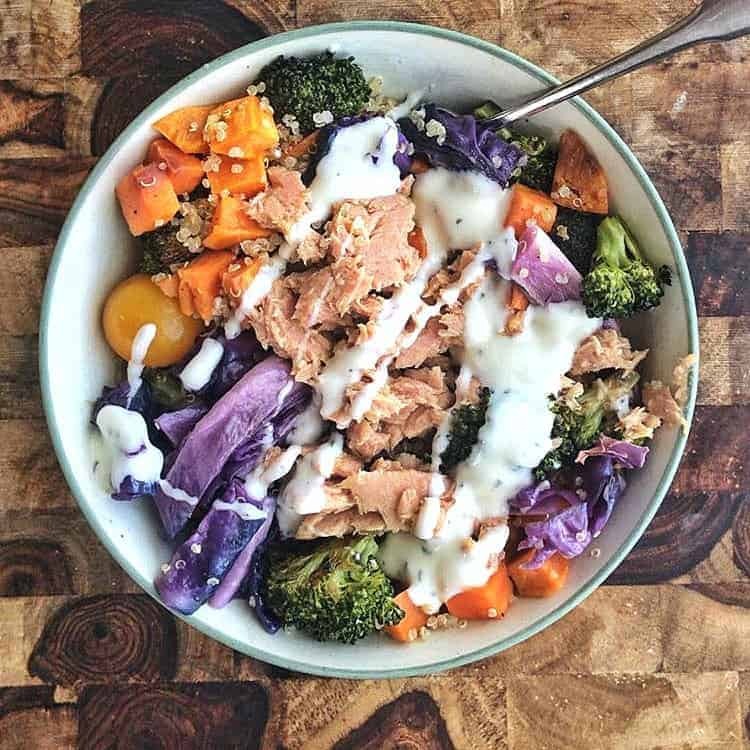 I loaded the veggies onto a bed of quinoa, topped it with tuna, and drizzled it with yogurt ranch dressing and let me tell you, it was fantastic! Place diced sweet potatoes, broccoli florets, and slice red cabbage onto baking pan. Drizzle with olive oil and season with salt & pepper. Bake for 15-20 minutes or until potatoes are softened. Place veggies in separate serving dishes. Serve by layering quinoa, veggies in a rainbow of colors, the fried egg, and top with dressing. Learn how to cook the perfect fried egg here. 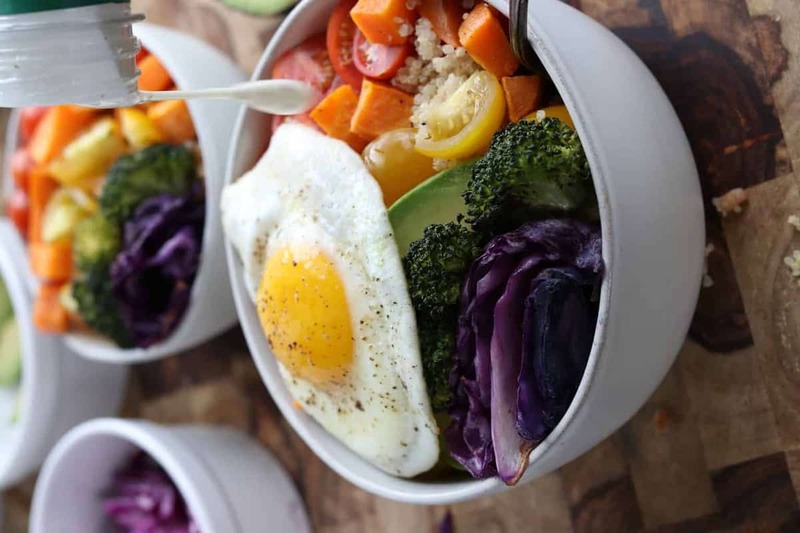 Substitute your favorite veggies to customize your own Rainbow Veggie Bowl! This was fun to make and even had my pinkie eater trying a couple bites of new things!